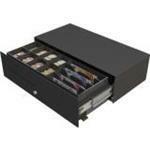 a compact, short opening cash drawer the micro, which accepts the majority of european currencies, is a uniquely designed drawer that has the same footprint as a flip lid but with all the functions of a front opening cash drawer. compact ideal for use in situations where space is limited, the micro features a short opening of just 173 mm. high capacity the removable high volume insert can accomodate 4 notes and 8 coins, with additional media storage underneath the coin cups. durable featuring a robust steel construction & steel ball bearing runners for a prolonged operational life, the hard wearing micro drawer is the preferred choice for leading retailers worldwide. versatile the micro insert is compatible with the 460 flip lid cash drawer, providing an easy and practical solution for retailers operating both flip lid and slide out cash drawers.